As seen on Sunday Brunch, 11 November 2018. As seen on BBC Breakfast, 9 November 2018. Catch up on iPlayer. As seen on Good Morning Britain, 8 November 2018. Catch up via the ITV Hub. Chosen by The Bookseller’s independent industry experts as Highlight of the Season in the non-fiction buyer’s guide 2018. You'll be £25.00 closer to your next £10.00 credit when you purchase 1918. What's this? The great merit of Van Emden, in addition to collecting the testimonies (between hundreds and hundreds it seems that the historian can always find those who bind to form a narrative continuous and exciting) is to have chosen photos of undoubted value. With 1918 van Emden has crafted another compelling account of the war; a soldiers’ account, rather than a comprehensive overview of the campaigns and battles of 1918, but one of the best titles on the final year of the war to have been published in the twilight of the centenary period. The latest in the author’s series in which he tells the story of the final year of the “War to end all Wars” based almost exclusively on the words and photographs of the fighting men on both sides who are no longer with us to tell their tale. The consequence is a gripping worm’s eye view of the final year of the War which helps today’s reader far better understand the needs, fears and expectations of the men on the ground. It is not, nor intended to be, a campaign history but provides a balanced general narrative with the experience of the individual soldier throughout the momentous final year of the War which proved to be the most costly to Britain in terms of casualties. Like his earlier volumes in the series; The Somme – The Epic Battle in the Soldiers’ Own Words and Photographs published in 2016 and The Road to Passchendaele - The Heroic Year in Soldiers’ Own Words and Photographs published in 2017, 1918 – A Decisive Year it is highly recommended. A rejuvenating work within a niche as trite as the First World War. 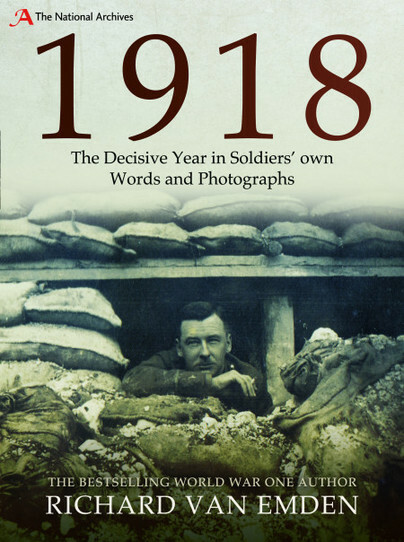 There will be those who buy this book for whom this is an entry into the Great War, and for those people this will be a terrific introduction: top authors, previously unseen photos, first hand veteran accounts and a skillful narrator in the shape of Van Emden. It has it all.